**This app is free with a merchant processing agreement. ** This app is intended to power a shopping cart that is integrated with Factor4's processing capabilities. 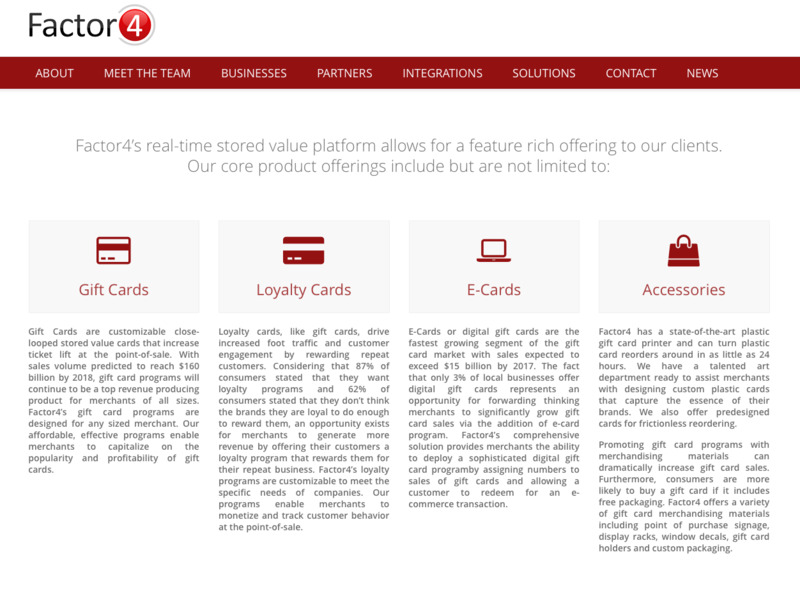 An online customer will be able to browse and shop on a merchant's website, fill their cart, and then at check out use our gift cards as one of the offered tenders. The app also will allow the purchase of gift cards for use online or in-store. This app is intended to power a shopping cart that is integrated with Factor4's processing capabilities. An online customer will be able to browse and shop on a merchant's website, fill their cart, and then at check out use our gift cards as one of the offered tenders. The app also will allow the purchase of gift cards for use online or in-store. This app is great - I can sell cards online or at my store and they work seamlessly.